Sandra has become one of my favorite brides of the year not to mention of all times. I've actually already completed her invitations but as you can see...I'm behind in my posts. So I'll start with her save-the-dates! Sandra did a lot of searching when it came to her stationers and she chose me!!! She told me that she had met with several "custom design" stationers. I along with those other vendors am an authorized dealer of Envelopments, Inc. This company sends all of its dealers stock samples to show clients and for inspiration for us as designers. These samples are also featured on their website. As she went to visit these other stationers, they all showed her these same samples. For her, it didn't represent what they as designers could do. I also have those samples, but when it comes to showing clients what my work is, its not the first thing I show them. All of my samples are of past clients and the work I have done for them. This was a big deciding factor for Sandra. She felt she had a good idea of what kind of work I could do for her. She also liked how I worked with color and she had some bold colors for her wedding, therefore she chose Invitation Creations, LLC. For her save-the-dates, she chose something a little more fun! We did a gatefold with one of her photos from her engagement session as its cover. Sandra wanted to be as involved as possible including the assembly. Hey!!!! Great idea!!! It save her some money and she had fun doing it! Here is what the final product looked like!! I can't wait to share her invitations with you! 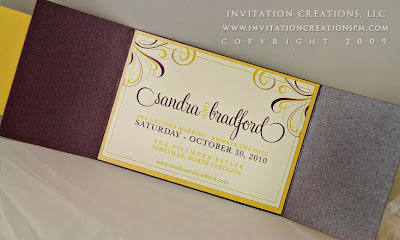 They are another first for Invitation Creations, LLC!